The month of March was a big one for the Rams as they went 13-5. The Rams ended the month by sweeping the Lock Haven Eagles 4-0 and averaging seven runs a game. The team looked to keep this success rolling as they looked over their schedule from this month. The month of April is packed with tough matchups as the Rams will face four PSAC teams. The Rams first matchup was against the East Stroudsburg University (ESU) Warriors. Their doubleheader weekend started at Serpico Stadium on April 6 with a 1:00 P.M. start time. Although a rough start to the game, West Chester went into the bottom of the second down 4-0, hoping to get some runs on the board. With a walk, single and a pair of outs, the Rams left their lead off man with two on and two outs. With sophomore Justin Horn at the plate, the Rams looked to rally. Horn delivered with a two run double. Following Horn, Kyle Feaster singled, allowing the Rams to tally one more run before the end of the inning. Although the Rams were able to pull ahead at the bottom of the third, they were unable to keep their lead. The Warriors took both wins on the day as well as their first match Sunday, leaving the Rams 0-3 to start. 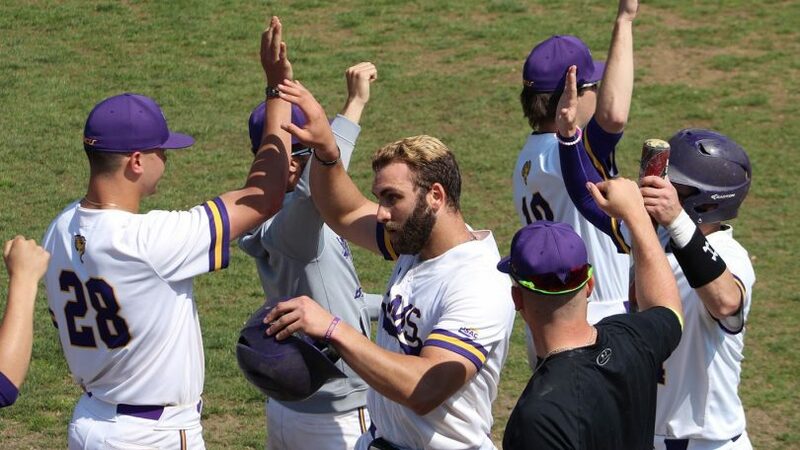 The second Sunday matchup was a different story for West Chester. The game was scoreless until the third inning when Feaster knocked in Horn with an RBI double. The bottom of the fifth was a big inning for the ESU Warriors, as they scored three runs that brought them to a 5-3 lead. The Rams were able to regain the lead in the top of the sixth with a grand slam from Horn. The Rams tallied on two more runs before the game ended. Following a tough 1-3 series against the ESU Warriors, the Rams travelled to Shippensburg to face the Raiders. Unfortunately for the Rams, they went 0-2 on the day allowing for 23 runs against and scoring only 19. West Chester hoped it would be a different story as Saturday came around. Luckily for the Rams, they had home field advantage for the Saturday double header. The day started off with their 1 P.M. game with sophomore Zach Rice on the mound. The Raiders were on the board with an RBI single at the top of the first. This didn’t keep the Rams from retaliating at their second at bats. With two on and Horn at the plate, he delivered with an RBI single to left field bring in the tying run. The Raiders came back with their own RBI single in the top of third to pull them ahead. Luckily, freshman Luke Cantwell was up to bat with two on base for the Rams. Cantwell hit a homer to left field to pull them ahead by two. The final score of the game was 10-2, with the Rams getting the win. The two teams faced again at 3:30 P.M. at Serpico Stadium. The Raiders came in hot at the start again with an unearned run which resulted from an error of West Chester’s right fielder. Lucky for the Rams, this would be the only run scored against. To start the second inning, the Rams had an RBI single from senior Jon Hansen to score Cantwell to tie the game. Later in the inning, freshman JR Gifford scored on a wild pitch, pulling the Rams ahead. Hansen himself also scored to end the inning Rams ahead 3-1. The next inning Hansen came up big with a two-run RBI single to yet again bring the Rams ahead at 5-1. The Rams scoring-streak ended at the bottom of the sixth with a three run triple from senior Joe Zirolli. The Rams ended their weekend battle with a 8-1 win against the Raiders. The Rams will travel to Philadelphia to face Chestnut Hill College this Thursday. A four game series with the Millersville Marauders will follow.